Father’s Day is just around the corner. Like Mother’s Day, though, this holiday goes much beyond gifts and greeting cards. This holiday is about celebrating dad and the family he helped build. It is a holiday in which we share our love and appreciation for the fathers and father-like figures in our lives – the men who have helped us grow, the men who remain important pieces of who we are. Fathers come in all forms, from all walks of life, from all different backgrounds and beginnings. Some wear suits and ties, some wear jeans and t-shirts. Some are overseas. Some enjoy projects around the home. Some are married. Some are not. Some dads become fathers through biology. Some become fathers through adoption. There is no single, universal definition of a dad, though they all have something in common: Dads have an unconditional love for their children. They support, teach, and try as hard as they can to be the best role models they can be. No matter how they become fathers, through biology or adoption, it is this unwavering love and support that truly makes a father a dad. Not only did this famed president declare the first National Adoption Week back in 1984, he also had a deep, personal connection to adoption long before his presidency began. 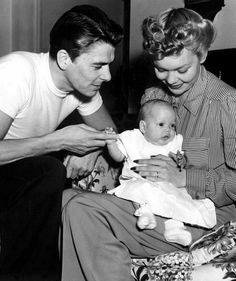 Ronald Reagan was an adoptive father himself. He and his first wife, Jane Wyman, adopted a son in 1945, Michael Reagan. You may know him as Wolverine, but this super hero’s two children just know him as “dad.” The legendary actor is also the proud father of Ava and Oscar, two mixed-race children who he and his wife adopted after finding out that they could not conceive. The celebrity couple tried IVF, and after Jackman’s wife suffered multiple miscarriages, they decided that adoption was the way they would build their family. The actor explains, “’From the moment we started the adoption process, all the anxiety [of infertility] went away. I don’t think of [Ava and Oscar] as adopted – they’re our children.” Jackman firmly believes that “adoption is about taking a baby into your home — and your heart.” He claims it is the best thing he and his wife have ever done. 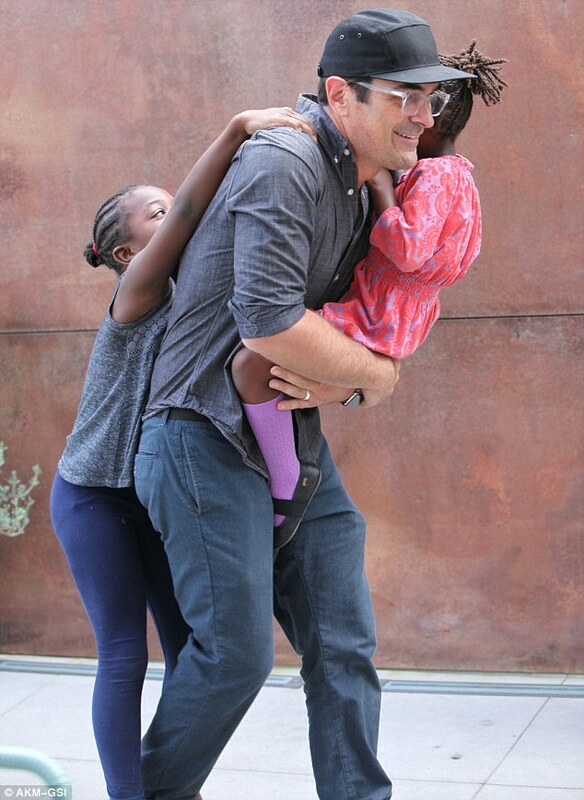 Hugh Jackman is not just a famous adoptive father, he is also a strong advocate for adoption and co-founder of the organization Hopeland, helping orphaned and abandoned children worldwide. Olympic gold medalist, famous figure skater Scott Hamilton is also an adopted person who has another title to write home about: adoptive dad. Hamilton, once adopted himself, is the father offour children: two biological sons (Maxx and Aidan) and two adopted children from Haiti (Evelyne and Jean Paul). Most known for his fatherly role in the hit TV series “Modern Family,” actor Ty Burrell takes his patriarchal role home to his own “modern” family, a family that he and his wife Holly have grown through adoption. Burrell is the adoptive father of two daughters, Greta and Frances. It may not come as a surprise that the man behind Cinderella, Snow White, and the Little Mermaid was also the fun-loving father of two daughters, Diane Marie and Sharon Mae. What many of you may not know, however, is that one of his daughters was adopted. Walt Disney and his wife Lillian adopted Sharon Mae at about two-weeks-old. After the birth of their first daughter, Lillian experienced several miscarriages and was advised not to attempt pregnancy again. But the couple was not finished. They chose adoption as a means to complete their family. The adoption of Sharon Mae was left off the press for years, as Walt Disney did not want her to be known as “the adopted daughter of Walt Disney.” She was their daughter – it was that simple. Brad Pitt is one of today’s biggest-name actors, and he is also the power-father of six children: three biological and three adopted: one from Ethiopia, one from Vietnam, one from Cambodia. Go Dad! Adoptions With Love extends a big “Happy Father’s Day” to all of today’s adoptive fathers – the famous and the local, the waiting and soon-to-be, the hard-working and devoted dads. We also wish a “Happy Father’s Day” to the compassionate birth fathers out there who supported the loving choice of adoption. To start your adoption journey with Adoptions With Love, please visit adoptionswithlove.org/adoptive-parents/ today. I really enjoyed this. As a father of three, two adopted, and one biological ( here on earth) I am encouraged to see the love that these “famous” fathers have for their children. I agree with Brad, I am thier father and they are my children.they all love eachother, play with eachother, fight with eachother…they are a happy 2,3&4 year old. Adoption is wonderful and have been so blessed to have done it.